Named for President Andrew Jackson, Jackson County was formed in 1852 from the southwestern portion of Lane County and the unorganized area south of Douglas and Umpqua Counties. It originally included lands which now lie in Coos, Curry, Josephine, Klamath and Lake Counties. After a history of boundary changes, battles, and settlements, the County now covers 2,802 square miles, of which 2,785 square miles is land and 17 square miles is water. More than 330 miles of highway run within the County’s borders, along with 127 miles of waterway and 73 miles of railway. 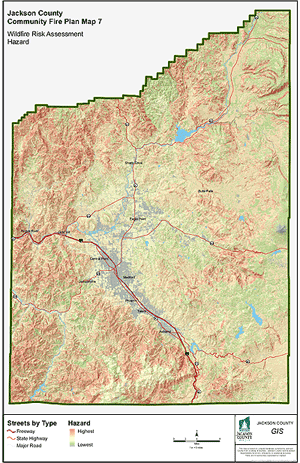 Jackson County’s population was over 203,000 in the 2010 census, and is estimated to have grown to over 206,000 in 2014 making it the sixth largest population of all Oregon counties. Approximately 70 percent of Jackson County residents live in the 11 incorporated cities, which include Ashland, Butte Falls, Central Point, Eagle Point, Gold Hill, Jacksonville, Medford, Phoenix, Rogue River, Shady Cove, and Talent. The remainder live in the unincorporated areas of the County. Jackson County is a beautiful place to live; however, it is vulnerable to a variety of natural and man-made hazards. Every five years, the County conducts a Hazard Vulnerability Assessment which identifies the top hazards likely to occur. This helps guide emergency planning efforts throughout the county. Agencies in Jackson County work closely together to help mitigate, prepare for, respond to and recover from emergencies, however there is no substitute for personal preparedness. In a hazardous emergency situation, first responders may not be able to get to you for several hours or even days. With several hundred first responders to serve a population of over 206,000, county residents should understand that it may take time for help to reach them. Experts suggest that you should prepare to be on your own for at least three days; however, seven days is the preferred standard. You are not being asked to deal with emergencies alone, but being prepared will allow emergency service workers to do the best job for you and all of the other impacted residents within our county. Personal preparedness begins with understanding what hazards exist where you are. One resource for identifying hazards in your neighborhood is the State of Oregon Department of Geology and Mineral Industries searchable Statewide Geohazards Viewer at http://www.oregongeology.org/sub/hazvu/index.htm With this free online tool, you can enter the address for your home, school, business, or public buildings in your area to see what hazards might affect you.